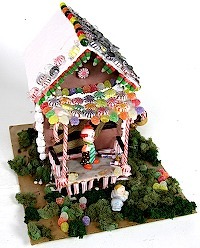 Have you ever tried to construct a gingerbread house? It is really hard. It seems almost impossible to make one that looks like something from a magazine. Honestly, though, the gingerbread is hard as a rock, tastes kind of dull and your house just sits and collects dust. Eventually in early January you take it out in the driveway and smash it up. Even the birds don’t eat it quickly. Why do people make so many of these things? Perhaps it is time for a re-think. 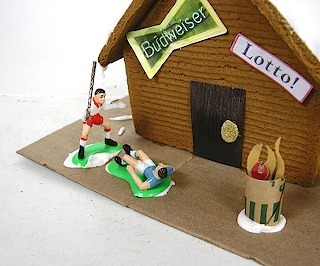 Maybe if some jerk started making run-down gingerbread homes and comical gingerbread businesses, people would see this activity differently. That’s me. I am a jerk and that is what I am doing. I am making the trashiest gingerbread possible and this is my website. Welcome to the Gingerbread Ghetto! If you want to participate, we’d love to see your creations. If we use your submission on the site, we’ll send you an almost worthless prize. Here is the first-ever gingerbread ghetto. It uses figurines I bought at the thrift store and some fun miniature stuff normally used in doll-houses. Did you know they make Pabst Blue Ribbon cans for your doll house. That’s a bit too realistic for me.